Am I right? You might have a few other pages and if you’re doing any content marketing then maybe you have some landing pages, but usually SaaS companies have very few pages on their site that can actually rank. On the one hand, this means that all of your links are consolidated to a few pages and thus you can probably rank well for those specific terms. But you are also limiting yourself because you do not have pages that target terms that your customers are searching for. You’re doing both yourself and them a disservice by not having these pages. Every keyword for which you want to rank should have its own dedicated page (unless it is a permutation, in which case pick the highest volume version). 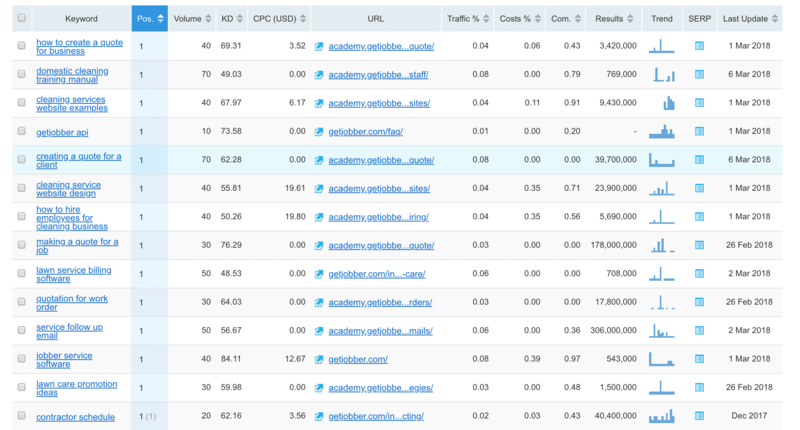 But how do you do keyword research for SaaS? That’s what I’m going to teach you here. Let’s talk briefly about targeting users in the search engines. When you (or ideally, your team) is writing copy for your site, are you thinking about a specific keyword that they might find you through or are you more concerned about the full topic for which your content should be relevant? How you optimize for informational queries such as “how do I write a great cover letter” is very different from optimizing for a transactional query like “proposal software”. Transactional keywords are the keywords someone types in directly before they buy. This may be things like [proposal software for lawyers] or [seo software]. These pages require a tight focus on your main keyword in your main page elements (title, URL, H1, H2, content) as well as more links to rank. These pages are about relevant information that leads the visitor to click your call to action and sign up (either to pay or for a free trial). Informational keywords, such as terms beginning with “how to” or “what is” tend to be content-based. Search engines are increasingly valuing long form content, which becomes the canonical piece of information about that topic, over shorter form blog posts and resource pages. Over the last few years, the search engines have moved away from specific keywords and began rewarding content that is in-depth and covers the topic at hand fully. While it’s believed that many preexisting components of the core algorithm remained intact, Hummingbird signaled Google’s commitment to an increasingly sophisticated understanding of the intent of searchers’ queries with the goal of matching them to more relevant results. While search engines still use keywords to determine what a page is about, they also now have a deeper understanding of what that specific keyword or keyword term is about and the other terms that it relates to. From this they build topics. Read the transcription on the original post. With this understanding, how do you do keyword research? Has it really changed over the years? Let’s talk about doing keyword research for your SaaS site. Before you start jumping into the data, you need to take a step back and think about the broader topics for which your website and company should be found. What features does your product offer? These give you the start of your seed keywords. It is important here to avoid industry jargon and to describe your product in as plain of language as possible. 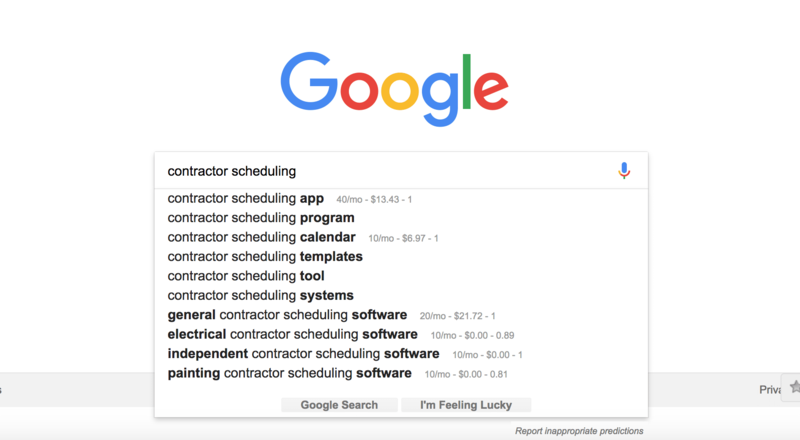 For example, “our product helps contractors manage their workers through calendar management, hourly billing, and scheduling through a web application and its accompanying mobile app”. Now we can use a simple hack (learned from Wil Reynolds of SEER Interactive) to getting ideas from Google. Now that you’ve brainstormed some of your main keywords, go to Google.com (yes, the Google homepage) and type them in. Then press space, not Enter, and see what comes up. The search volume you see beside the keywords is courtesy of Chrome extension Keywords Everywhere. Click the Add All Keywords button in the lower right then keep going down the rabbit hole. This is a fantastic way of getting a great set of seed keywords to begin with. This is often the highest return on your time to identifying your main conversion-oriented keywords as well. The next step I always take is to gather a list of competitors and run their site through SEMrush (other tools like Moz also allow for this) to understand the keywords that they are ranking for. Some competitors will be more useful than others, but what we are looking to do is expand the keyword set you are working with based on what your competitors are themselves targeting. Note that this used to be a lot harder. Circa 2008-2011 we were scraping competitor websites using tools like Screaming Frog or custom scripts to understand their meta keywords tags (a now-defunct meta tag that was not worth covering in the meta tags section of this guide) and thus what they were targeting. 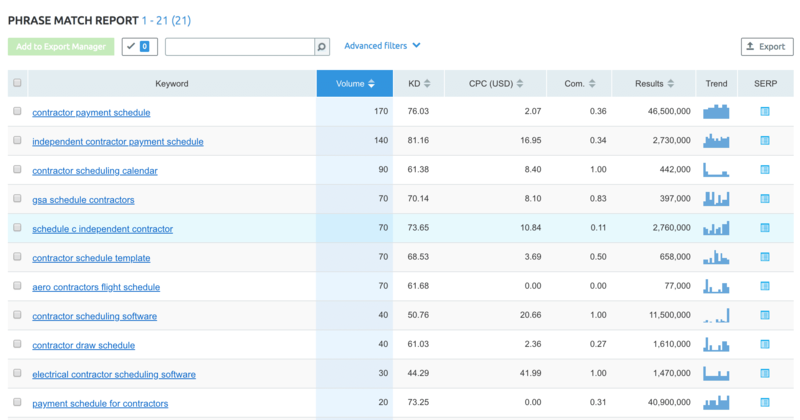 Let’s look at how to use competitive analysis for keyword research. From here, download the keyword report, then rinse and repeat this strategy for your other competitors. You will end up with a spreadsheet with all of your competitors keywords which you can then de-duplicate and arrive at a set of keywords with search volume for which your competitors are ranking. Now that you have a large list of your competitor’s keywords, it is time to further expand your keyword set. Depending on your competitors, they may or may not be doing a great job with SEO and thus just doing competitor analysis will leave other potential profitable and traffic-driving keywords out of the list. Rinse and repeat this with your major keywords to make sure you are grabbing as many potentially relevant keywords as possible. Once you have a list of keywords, ideally in Excel, with search volume and CPC (cost per click from AdWords), you can start to evaluate if a keyword will be both worthwhile and profitable to pursue based on potential traffic it can bring and how much money it can make you. The “how much money it can make you” is a metric that depends on your business, specifically your pricing and your conversion rates to paying customers as well as your retention/churn. If you already have data on specific keywords from AdWords bidding then you can use this data, but otherwise it is something you can benchmark for ideal conversion percentage and then adjust over time to determine profitability. It is often impossible to find low competition and high volume/CPC keywords, so often you will settle on highly relevant to your business and high volume while also knowing that these keywords will be challenging to rank for and thus will require perfect on-page SEO as well as a fast website and links into the specific page. That’s just SEO for you. As mentioned at the beginning of this section, Google’s Hummingbird algorithm update in 2013 began moving us away from solely focusing on keywords to needing to understand the deeper intent behind the keyword. Breaking your keywords into these two buckets is the next step to understand what kind of content and what kind of page you should build to effectively target it. The best way to do this is to go through your list and determine if the keyword is a core feature or descriptor on your main keyword. For example “employee scheduling software” and “employee scheduling software for restaurants” are transactional, whereas any “how to” is informational. These pages should have dedicated landing pages created because they are not only targeting specific keywords and thus need a dedicated page to rank, but they could convert for you and thus should be conversion-oriented, whatever that means for your app (free trial or direct sign up). If the keyword phrase is not the above, then it is informational. These can be targeted with blog posts or larger resources, depending on the potential volume and where they fall within the funnel (top of funnel for awareness, mid-funnel for more specific questions if the searcher is familiar with the industry). This also applies to keywords such as “template”, “guide”, or “what is”. We will talk about using informational keywords for SEO more in the Content Marketing section of this guide. Now you’ve done all the heavy lifting. You have your keywords identified, both your main conversion-oriented keywords of which there are likely 15-20 and your informational keywords of which there are likely many more. Now take those keywords and map them to the specific URLs on which they will live. We’ve now talked about technical SEO, including getting your pages indexed and discovered through technical platforms that can be crawled and letting the search engines know about your pages, and we’re talked about keyword research. After you build these pages, how do you link to them so that they have the best chance of ranking? Since we’re talking about SaaS websites, let’s presume that your main keywords will be targeted by either features pages or pages targeted at specific personas. I’m going to show you an example of structuring your information architecture feature pages, but this can also be adapted for personas. 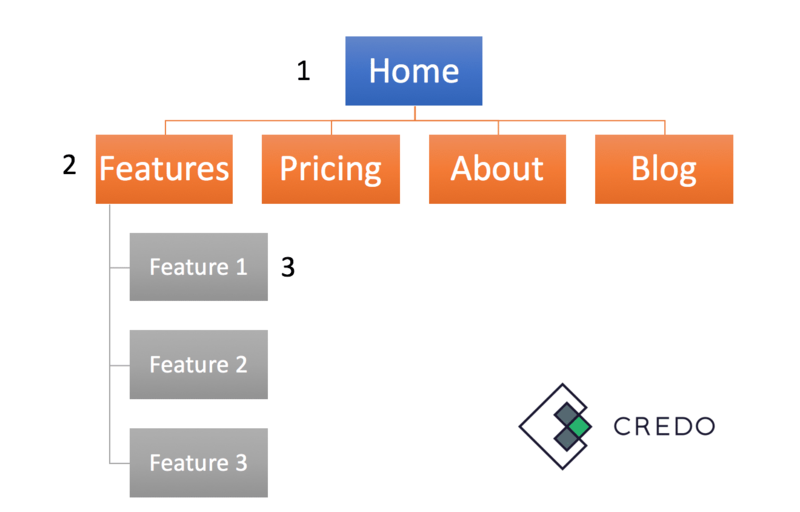 In this example, you link from your homepage to your features page, when then links down to each feature. If your keywords are high volume and it works with your design, then you can also consider a dropdown in your top navigation to make these just one click from your homepage. Either way, your feature page should be close to your homepage within 2-3 clicks. What really gets them to rank is external links, which we will talk about over the next two chapters.